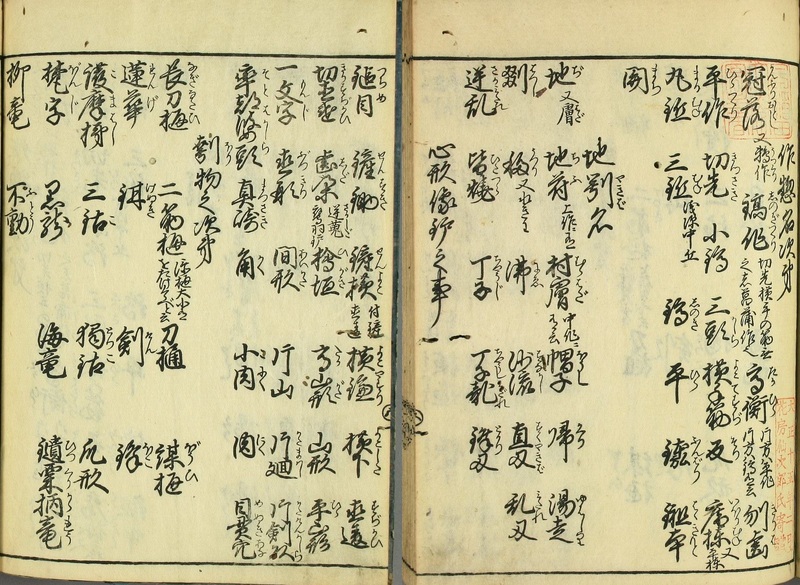 Looking something up the other day in the Kokon Mei Zukushi (古今銘尽), I also browsed through its fifth volume again, the one which introduces workmanships of different smiths. Doing so I remembered how the uncommon way many terms are written therein gave me quite a headache when I worked through this publication for the very first time. So in this sense, I thought that it might be of interest, for the kanji nerds out there so to speak, to present them here. The “list” is not very extensive and don’t worry, you don’t have to memorize them as they are no longer in use. Most of them are phonetic substitutes, whilst there are also some semantic substitutes. I point out the former via (PS) and the latter via (SS). Also, I am not talking about the use of old and unsimplified characters, an issue that I have addresses a while ago here. I am talking about the use of odd or rather very uncommon characters and/or substitutions. So in the brief list below, I will also add some explanations and as mentioned, this humble post is more for the kanji cracks. kenuki (鑷) – [毛抜] – The opening in the tang of a kenukigata-tachi, i.e. (鑷) has the same meaning of “tweezers” but came out of use to refer to the kenukigata opening/interpretation. mune (𫒒) – [棟] (PS): (𫒒) reads mune and has to be taken literally, i.e. as “metal (金) hill (丘).” For example, the literal meaning of this term was also quoted with the charactes (刀背), i.e. “sword (刀) back (背)” whereas the two characters (刀背) were then again read as mune. sujikai (直違) – [筋違] – Interesting case as we have here a coming together of several substitutes. First of all, the term sujikai originally referred to braces, i.e. slanting beams giving extra support between horizontal and/or vertical members of a timber frame, forming a X when mounted. Thus this term was initially written with suji (筋, “sinew, tendon,” or also something long and linear) and kai (交い, “alternate, cross”), referring to the X shape of the braces. But then this writing of the term (筋交い) was replaced by (筋違い), which reads suji-jikai in the strict sense, i.e. suji (筋) and chigai (違い, voiced jikai). Therefore we find this term, or the yasurime in question, sometimes quoted as suji-jikai. But even if replaced by (筋違い), the initial reading of sujikai of the characters (筋交い) was kept. In short, (筋違い) should also read sujikai but suji-jikai is not wrong of course. Back to the Kokon Mei Zukushi. Therein the term was so to speak “re-split-up” from suji-kai to su-jikai and the su (which should actually be suji [筋] and not just su) was replaced by the homophonic (直). yakiba (㓵) – [焼刃] – The etymological meaning of (㓵) is “sword” or “double-edged sword” but it also had the meaning of “edge of knife,” so that’s why it was used to represent the term yakiba. 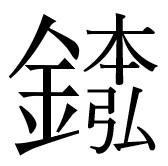 yasuri (鈩) – [鑢] – This substitute is insofar interesting as it is the (simplified) variant (itaiji, 異体字) of the character (鑪) (note the different radical on the bottom left, i.e. 心 and 皿). In other words, (盧) gets replaced by (戸) and (慮) either by (呂) or (虑). So the character for yasuri (鑢) should actually be replaced by (鋁) and not by (鈩). And below the two introductory pages in question of volume 5, just in case you want to do some deciphering yourself.